UVB - Lamps > FACT! 92.4% of UVB patients get better after 2 weeks of treatment! > Half of people diagnosed with psoriasis suffer from scalp psoriasis. We know how to help! Half of people diagnosed with psoriasis suffer from scalp psoriasis. We know how to help! Introducing UVB lamps – an effective, painless, and safe way to get rid of scalp psoriasis. This device will help to control psoriasis outbreaks and to get rid of flakes and other unpleasant manifestations. This is proven by numerous research and reviews. Spend a little time to learn about all the benefits of treating scalp psoriasis right now. – The evidence of the effectiveness of psoriasis treatment with UVB lamps can be found here and here. – Customers’ comments about convenience, safety, and efficiency can be found here. – The treatment can be done at home. No more inconveniences or feeling inferior. It takes just a few minutes a day! – UVB lamps are absolutely safe to use if you carefully follow the instructions. – You can buy a lamp now at a competitive price. half of them suffer from psoriasis of the scalp. The most important fact, that psoriasis is incurable, is hidden by pharmacological companies. There are three known ways to control the disease and minimize its manifestation: external use of medications (creams, lotions, emulsions, etc. ), the use of oral medications (tablets), and light therapy. Phototherapy treatment provides efficiency and health safety. 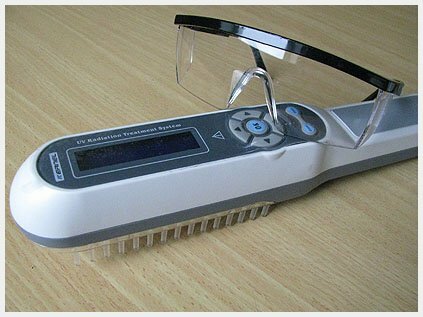 UVB lamps with a wavelength of 311-313 nm is one of the best ways to get rid of the emotional problems associated with scalp psoriasis. Attention! 92.4% of people who use the UVB lamp notice a positive change in their condition after two weeks of treatment! 1. Quality product. We work directly with the manufacturer. You get a new lamp ready for use right after unpacking. 2. Fast shipping. You can choose the delivery company yourself. Delivery by TNT, FedEx, and USPS Express Mail usually takes between 4 to 7 working days to any part of the world. If you live in the US or Canada, you can receive the package within 3-5 business days. 3. Replacement and return. If the lamp is damaged during delivery, we offer a refund or exchange. If you don’t see the result using the lamp, we will refund your money (minus 15%). You pay only for return shipping. 4. Warranty. UVB lamps bought on our website have a 1 year warranty. The exception is the light bulb. It is not covered by our warranty. Use UVB lamps and forget about your problem! You can’t forget about your disease. You are constantly reminded of it by the glances of strangers on the street who see the flakes of skin in your hair. You see the pity and compassion in the eyes of your family and friends. Forget about shame and dissatisfaction with your appearance! You can forget about all these problems after using the light therapy. For effective treatment, you will need a doctor’s consultation and a UVB lamp that should be used carefully, following the instructions. Treatment of scalp psoriasis has never been so easy, painless, and effective. The effectiveness of light treatment of scalp psoriasis has been clinically proven. You can find the information from the studies here and here. “Thank you for the opportunity to live a life full of colors, and for the fact that I can go to the beauty salon again without being stared at”. “Guys, thank you! You gave me a second chance. Me and my family feel happy again, like in my young years before psoriasis”. Phototherapy is absolutely safe for your health. Follow the instructions and exposure time carefully. UVB lamps are safe, even for pregnant women. Is it possible to effectively treat psoriasis at home? Definitely. UVB lamps are made for home use. The compact model has a timer for your convenience so you don’t forget to turn it off at the end of your session. 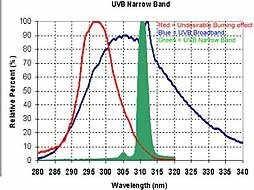 Can a UVB lamp help me if I have psoriasis not only on my head, but also on my neck? Yes, certainly. Lamps can be used to treat psoriasis, vitiligo, eczema, and seborrheic dermatitis, which is often confused with scalp psoriasis. What are the contraindications to phototherapy? Phototherapy is considered to be safe even for pregnant women. You can read about the safety of phototherapy for vitiligo in children here. It is important to remember to follow the instructions during the procedure. If you have any questions, feel free to contact us and we will provide you with detailed information.